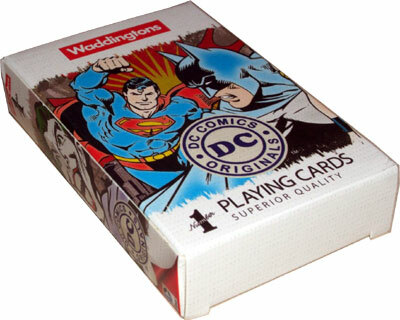 Waddingtons ‘DC Comics Originals’ deck was published by Winning Moves in 2014. 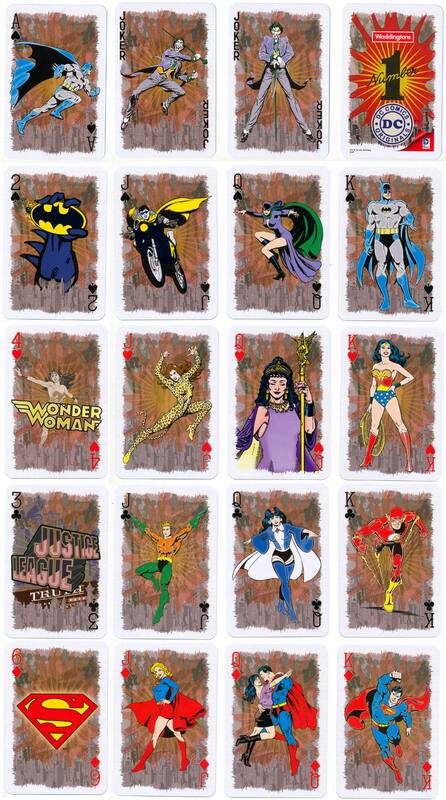 Each suit is assigned to a different fantasy superhero comic: Spades are ‘Batman’; Hearts are ‘Wonder Woman’; Clubs are ‘Justice League’ and Diamonds ‘Superman’. The pip cards have assorted single images (repeated in each suit); each ace and court card is presented with a different character pertinent to the relevant comic. The jokers are aptly the ‘Joker’ from the Batman comic, each of two jokers showing the same character in a different pose. All the images are set against an energy burst background as seen in the original comics, adding a sense of dynamism and ambience. Above: Waddingtons ‘DC Comics Originals’ deck published by Winning Moves, London, ™ & © DC Comics. 2014. Manufactured in Poland. Images courtesy Matt Probert. 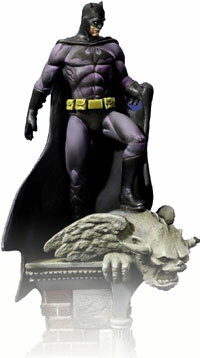 Batman figure courtesy Iñigo Rodriguez Carballeira.